There are a number of aspects to being a professional bass lure fishing guide that provides a great deal of satisfaction – things such as assisting them to catch their first ever bass on a lure, their largest, or perhaps their first in darkness. Sometimes, just confirming that the way they are ‘working’ a lure is correct, to allowing me to ‘tweak’ their casting style so that the lure sails out consistently into the desired area can make a huge difference to the client also. 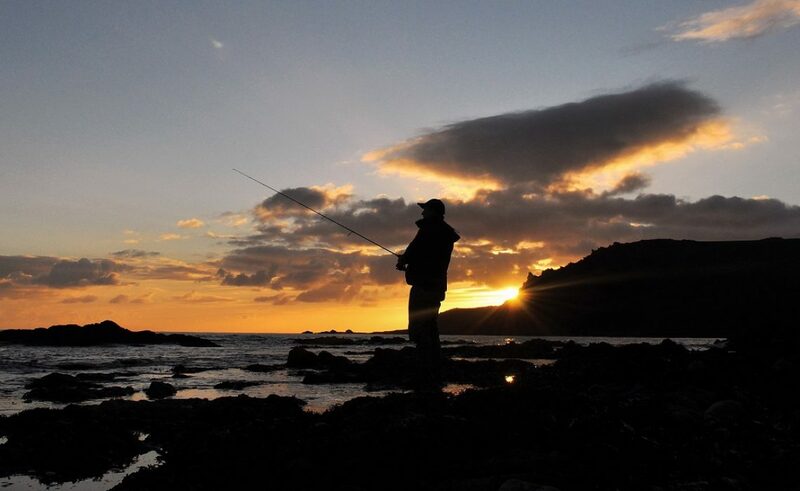 From my perspective, there is a set of circumstances that regularly occurs within a session, that brings me the most amount of satisfaction however – standing a client within a very specific feature amongst the seabed (exposed by the tide) or highlighting it to them from the rocks or cliffs above, and then watching them catch a bass from that very zone once the tide has flooded into or over it. My client during a recent session (Stu) has been an avid follower of my blog and Facebook Page here for some time. Therefore, it was a real pleasure to actually meet him at last, and with the tide flooding throughout the afternoon and early evening, the plan was to target a small (300m) area of coastline made up of a cluster of marks within it. As we navigated a sandy beach and scrambled carefully over the adjacent boulder field, the landscape of even craggier rocks, interspersed with sand patches and heavy weedbeds, was a completely alien experience for Stu. The reason was that since he’d ‘taken up’ bass lure fishing from the shore he’d only really fished lagoons and estuary mouths with a sand/mud seabed and with lots of tide/current and within relatively calm and settled sea conditions. This was exceptionally rough ground it has to be said, but by standing Stu onto what would later become an island over high water, from our perch I pointed out a deep gully that meandered through the reef system in almost a large ‘S-shaped’ pattern. In my eyes, this is a ‘classic’ bass patrolling route linking the open sea to the sand beach, and that bass will follow as the tide floods or ebbs. Further along the rocks, I highlighted the deepest section of the gully, adding that a previous client had lost an estimated 6lb bass (right at the net) by casting a large surface lure into this very precise area a couple of weeks previously and in very similar sea conditions. These sea conditions were also bordering on what I would call ‘rough’ with a lumpy 1m swell combining with a very large spring tide and a brisk southerly breeze to create some wonderfully ‘aerated’ water breaking around the rocks – it looked good! All the gear, but a very good idea! In conjunction with a very inclusive selection of lures, Stu’s weapon of choice was a very nice (but very expensive) Shimano Exsence Infinity lure rod here twinned with a Shimano Twin Power XD 3000HG here – a combination that offered exceptional control and casting accuracy. He had a very good grasp of what was required and was doing an excellent job too, which considering the unfamiliar terrain, submerged and protruding features, plus what were testing weather conditions was testament to his ability as an angler – all we needed now was a bass! Now, it would be easy to say that ‘the change of lure made the difference or that it was an ‘inspired decision’ to ask Stu to change over to what is, without doubt, one of my favourite lures and one that is becoming increasingly difficult to get hold of – the medium diving (2-4ft) IMA Hound Glide 125F here. A modern classic? I think so. The IMA Hound Glide 125F in the ‘Bora’ pattern. It was at this juncture that I asked Stu to wind back a few hours and to recall the deeper 3m² section of that meandering gully that he’d witnessed (that was now submerged alongside the surrounding rocks) and to keep casting continually into that region and that region only. There just had to be a bass moving through in these conditions, and historically, everything that I knew and had previously experienced here came flooding back. “Just keep targeting that zone,” I said. If you follow my blog regularly you would have probably chuckled at the number of times I have turned my back on a client and walked away in order to answer a call of nature, only to hear them bellowing my name when a bass has smashed into the lure… Well, following 20 minutes of fruitless cast and retrieve on Stu’s part it happened again! This time, I was just putting my arms through my Savage Gear jacket here when I peered over my shoulder just in time to see Stu’s rod yanked over – alarmingly so! Before he’d had time to even check on my whereabouts I was hurrying back across the rocks towards my net. With a ledge, some 6ft beneath the surface in front of us (that I’d highlighted to Stu as a potential problem if he hooked a bass) to be overcome Stu maintained the ideal amount of pressure and side strain on this fish – one that took a long time to surface (which generally means they are either of a good size or foul-hooked). Look at the gob on it! After taking some line initially, the bass ‘kited’ to our left (and over that ledge) before attempting to head for an area of the seabed with slightly raised rocks that we could just make out in the green-tinged water. Again, Stu applied the appropriate amount of pressure in order to steer the fish away from danger and towards us. “Yes! It’s a good one mate” I said, as the fish surfaced around 8m out – it looked angry though! With my net at the ready, Stu brought it closer, but upon seeing me it flipped and headed to the right and (unsurprisingly) parallel to our position. Conscious (exceedingly so) that a client had lost that six-pounder in the exact same position only days before I was astounded at how easily (in comparison) that this one allowed me to eventually scoop her into the net as a larger swell moved through. “Look at the gob on it!” we both remarked! This bass, that did its utmost to tangle itself in the net as I tried to unhook her (hence no photograph of the fish with the lure in its mouth) was as near as damn it to 60cm (around 5lb) as I could record under the circumstances, and upon holding her she probably had the head and mouth of a seven-pounder! A happy client of ever I saw one! Well done Stu. The bass was returned unharmed and swam away very powerfully (the Action Camera video gives the mark away hence no footage) and Stu decided he’d had his fill soon after. 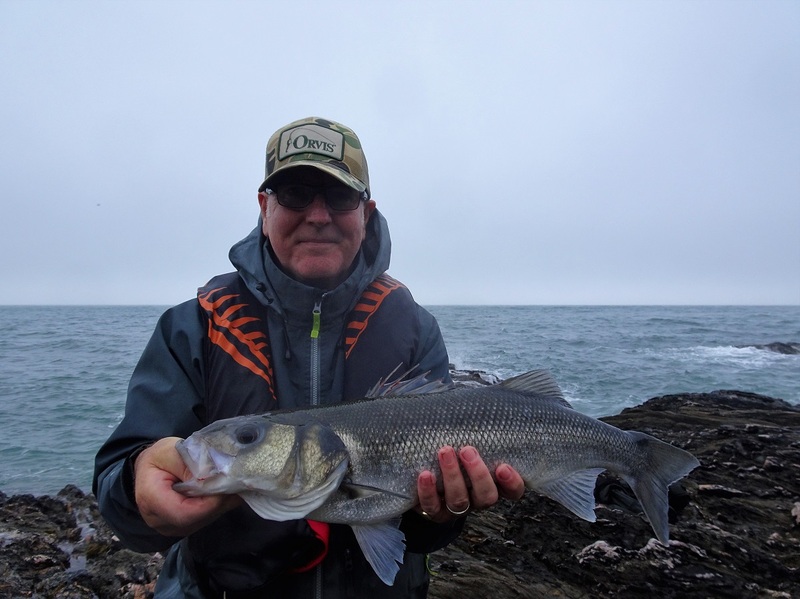 It had been a successful session – Stu had learned some new skills in relation to bass lure fishing over rugged territory and, of course, he’d landed a beautiful bass for his efforts and the drive down to south Devon. Finally, it just goes to show that if you have confidence in the location, the method and the lure, and all the other ingredients (sea state and stage of the tide for example) are also in place, that bass can be relatively predictable in their behaviour – sometimes you just have to keep at it. If you are interested in purchasing my book (that is due for release on the 8th October) titled ‘The Lure of The Bass’ please see my recent blog post here for details on how to reserve your copy.